You may have seen beauty products like vibrating foundation and hair treatments with placenta, but did you know women actually love them? 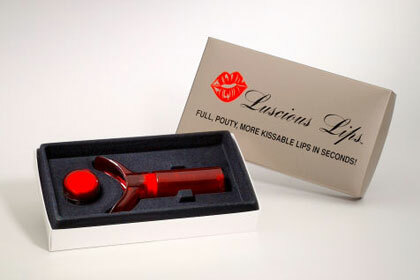 Cynthia Rowland Luscious Lips, $59.95 Featured on "The Rachel Ray Show" and "The Doctors," this lip pumper (that's right "pumper") works as a lip plumper for "full, pouty, more kissable lips in seconds," the website boasts. It looks a bit like a medieval contraption, and you should likely shut the bathroom door while using it. But, women claim it actually works wonders and "DELIVERS what it promises without pain, stinging or injections," says one enthusiastic reader. "This product is awesome. I use it everyday and it lasts about two hours I would say. When I look at myself before and after, it's amazing. My lips look huge, but natural as well. Seriously, you women who are thinking about getting lip injections, think twice," claims another Total Beauty reader. Interesting..This products are interesting to give a try!! i want to try the heated eye curler. i love it! Placenta shampoo has been around for years. I would so use these products, really neat! !